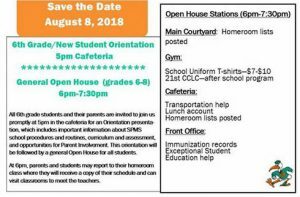 Southport Hurricanes – We are so excited to welcome you back for the 2018-2019 school year!!! We look forward to seeing everyone at our Open House on August 8th. Sixth grade/new student orientation begins promptly at 5 PM. 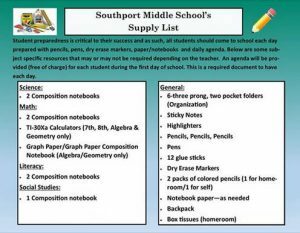 Please see our general school supply list so that you can be prepared to start the year off organized and ready to learn. 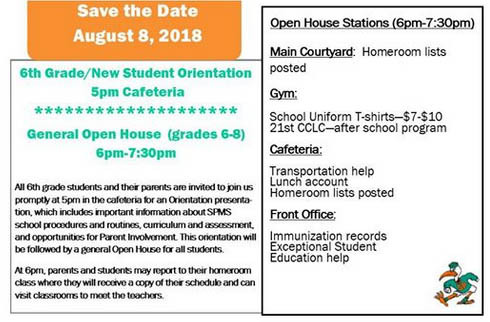 Also, be aware that some individual teachers may have a few more specific requirements which will be included in their syllabus and handed out the first day of school. 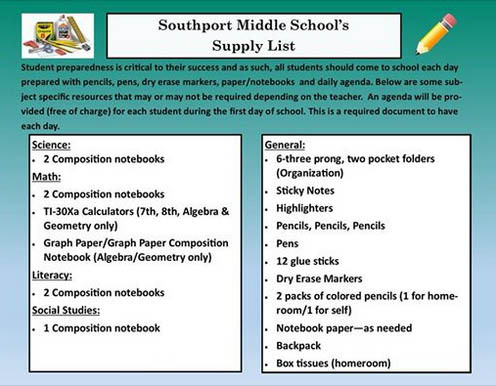 Our Southport Middle School Dress Code is posted below. You can also view pictures of the IB Shirt Designs. Each IB shirt is $10 and is a 100% combed cotton. The Southport Embroidered Emblem shirt colors are: Black, Teal or Orange. These shirts are $7.00 and are 100% cotton. They will be for sale during our open house on August 8th starting at 6:00 p.m. in the gymnasium.